Blue-eyed Mary, Dog. See a Pattern? Inhabited by a bat. When Bill lifted the lid and sort of shrieked, it huddled closer into itself but didn't fly. He left it be and called me. I don't know why this photo is squishy. It just is. We took to going up to the tower to wait for it to emerge in the evening. Here's a video of that event. I go kind of nuts when I manage to capture the exodus on video. Geekin' out like most people do over movie stars. As most of my stories do, it just gets better. Because that bat stayed with us for much of the fall, went to parts unknown for the winter, and then another appeared this spring!! I'm twirling with delight. I mean, that bats can find this tiny switchbox and decide to roost in it...it just seems too good to be true. I was pretty sure the autumn animal was a big brown bat. It looked just like the bats I'd been tending.This photo was taken October 4, 2012. See how he almost fills up the switchbox? His foot is hanging on to a little Phillips head screw. 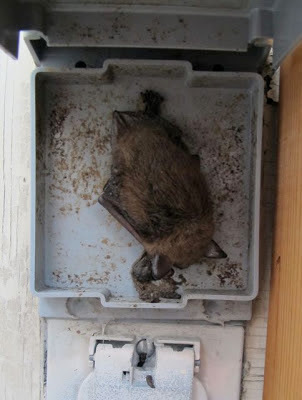 compare now to the spring 2013 bat in the same box. See how you can see the switch and how much shorter he is? Teeny. This photo taken 5/09/13. So I'm pretty sure we had two different bats. But were they two different species? Science Chimp had to know. I did not want to handle this trusting little animal, and possibly frighten it away from its chosen roost. A switchbox full of pee. May 15. Hmm. Short muzzle, and the muzzlepuffs aren't very puffy. 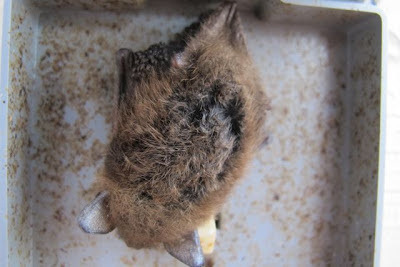 Big brown bats have inflated-looking muzzlepuffs. Fur's kind of mussed up--maybe an old injury? Dunno. Wow. Really short muzzle. I'm trying so hard to get a shot of the tragus inside his ear, to see if it's narrow and pointed, but I can't do it without scaring him. 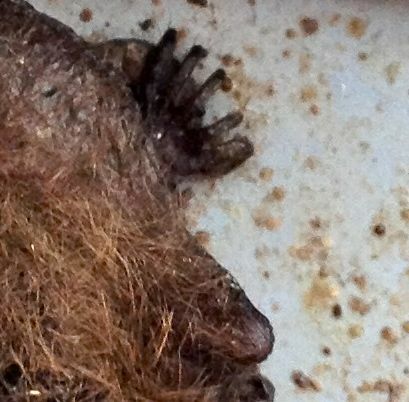 (Big brown bats have a blunt-tipped tragus). Wait. This one looks good. Yep, end of tragus looks pointed, all right. One more character to check. I shoot his foot and blow it up. Look. Little hairs that extend beyond the ends of his toes! 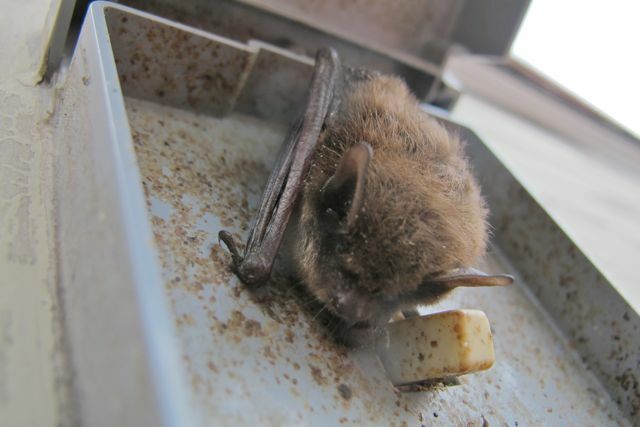 Believe it or not, a distinguishing characteristic between little and big brown bats. I know. Ridiculous, but true. Who ever noticed that?? He's a little brown bat. And I have learned something. Thankful for Fiona Reid's marvelous Field Guide to Mammals of North America (4th Edition), Houghton Mifflin Harcourt, one of the Peterson Field Guide series. Illustrated with her clear paintings, it pointed me in the right direction to identify our scruffy little treasure. He's moved on to his summer roost, wherever it may be. I hope his big cousin comes back in fall. And of course I hope Little Brown is back in spring 2014. Bats are creatures of habit. And now, some more bat poetry. Batterel. Not doggerel. To have another bat to love, be he girl or boy. Of bats and night and magic, forever let us sing. 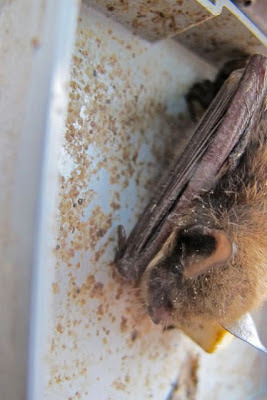 **Bobby is a big brown bat who's been roosting all spring and into fall in one of the windows in Mimi's farmhouse. For 15 years he has returned in May, and he was late this year, but he came back, sending both me and Mimi into transports and tears of joy. Most of the photos in this post were taken with my iPhone, because I can tell it what to focus on at very close range. Another amazement. Now the real trick will be to catch (film) him going in! Love it! "Move into position! Move into position!" " I didn't get it." What fine memories your family makes and how keen the powers of observation you value! What a place to hang out! ooh ooh! I have a bat story. When I was small, one night my mom was up watching TV. And something went "swoosh" in the house. And she thought, "Oh, a bird must have gotten in. Wait. It's night." and she slowly went to the next room and "swoosh" goes the bat. It took up residence behind our dining room curtains. We closed it in the room and the next day called around and found someone to come and get it. We never could figure out how it got inside. We had a sudden winter warm spell and then went back to winter, and they said this thing was going back into hibernation in our dining room. They said they would take care of it until spring. It is forever known as the bat room. 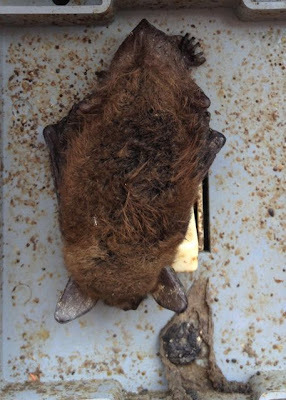 When I moved into the house I share with my mom, the house inspector told me there was a bat on the outside of the house, under the roof vent. I was so excited. One night a bat swooped by my mom and she screamed and carried on for ages. I simply wished I had seen it and told her to calm down. Yay bats. I was leading a nature walk a few weeks ago and got to talk about bats and try to correct some of the myths. Yay bats. I love almost all of God's critters including bats. This one is a dear little fellow, and I am glad it has found a safe place at your home. You don't suppose these delightful creatures are related to the Hobbits of Middle Earth, do you? I loved every moment of that video, Julie! I'm so glad you caught the exodus for all to see, and I am tickled with your delight at catching it. You rawk! 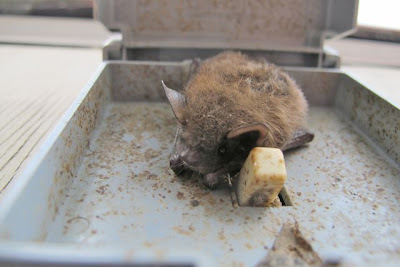 We realized we had bats this summer, we have heard this weird clunking sound at night for a couple of years. It turned out to be bats hitting our metal roof and skylight as they fell from the chimney. we have been watching them through the skylight a they hit and then swoop away. They are so neat to watch at night and do keep the mosquito population down. We have a gas insert so apparently they like the heat and keep coming back. We are going to buy or make a bat house for when they return next year!